BOGO Cold Stone, Today Only! Unless you’re living in the dark recesses of a cave, you’ve noticed that it feels a lot more like June than March, especially today. Good news! Today only, you can print this coupon and get a FREE Cold Stone Creation when you buy any Creation of equal or lesser value! The coupon expires today, so head on it if you want to take advantage of this deal. Comments Off on BOGO Cold Stone, Today Only! You can still snag this deal today! It’s time to start thinking about spending time outdoors again (yay!!). Today’s Clarksville Daily Deal is a $250 Parks & Rec gift certificate for $125 good for a personal year-long pass, OR towards the purchase of a year-long group or household pass (it’s just $20/person for each additional family member). View the full price list here. It’s a big one-time purchase, but remember that it gets you benefits for an entire year, including the winter months at the Indoor Aquatic Center! Opening day of Summer Swim Season is May 26, 2012 with 5 outdoor pools for you to choose from! Get your discounted passes today and swim all year long! Today’s Daily Deal is good for a personal year-long pass, or towards the purchase of a year-long group or household pass. Click here to see the full price list. Passes are only redeemable at our Main Office located at 102 Public Square. ONLY valid towards ANNUAL passes. Redeem at Parks & Rec main office located at 102 Public Square. Subscribe to All You Magazine for Just $12! Update: the page doesn’t give you an option to choose renewal, but I purchased one and it did, in fact, automatically extend my current subscription. Right now you can snag a one-year subscription to All You magazine (aka the magazine every couponer has to have) for just $12. That’s a great price! Woohoo! Food Lion has released four new FLIPs (Food Lion Internet Printables). 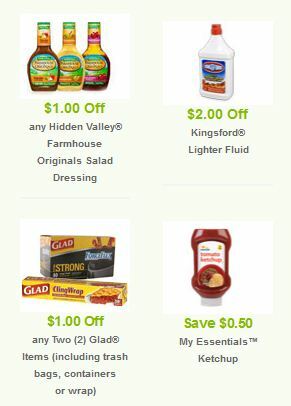 I don’t actually shop at Food Lion, but our Publix accepts them as a competitor, so you can use these coupons just like Publix store coupons! That means you can combine them with manufacturer coupons to score an even sweeter deal. You will only be able to print them once, so make sure your printer is ready. Comments Off on New FLIPs! FREE Birthday Card from CardStore.com – Last Day! Today is the last day to take advantage of this great freebie. CardStore.com is giving away 25,000 FREE cards! How cool is that? Just choose your card (up to a $6.00 value), personalize, and checkout! Comments Off on FREE Birthday Card from CardStore.com – Last Day! Visit the Kraft page at Walmart.com and print a $1/1 Planters Peanut Butter coupon! FREE CoffeeMate (Mark Your Calendar)! Okay, so this freebie doesn’t go live until next Friday (March 23rd), but go ahead and mark your calendars now! 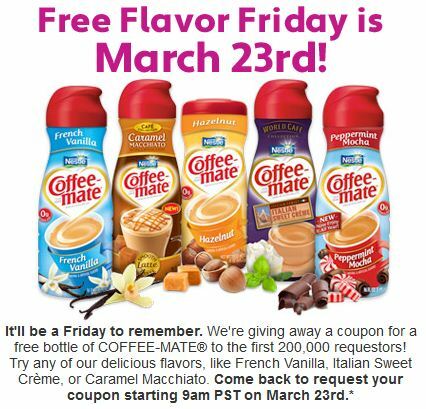 That day at 11am central time, they will be giving away a FREE bottle of CoffeeMate creamer to the first 200,000 people to request one! Love! Comments Off on FREE CoffeeMate (Mark Your Calendar)! 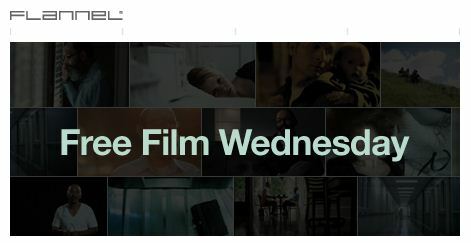 Please join us each week at premiere.flannel.org for Free Film Wednesday! Starting today, we’ll be showing one Flannel film for free each Wednesday, selecting from all our series and speakers. We’re starting out with the second film in the Ed’s Story series, Consider the Birds. If you’d like to view the first film in that series, you can always do so at edsstory.com. Enjoy! Flannel produces some great Christian films that tackle various spiritual issues. They are probably best known for the Nooma series which features Rob Bell (my current thoughts on Mr. Bell aside, the Nooma videos were really well done). Half-Price Starbucks – Last Day! Last day to take advantage of this! When you buy any full price espresso beverage before 11am at Starbucks, you can bring your receipt back after 2pm the same day to receive another espresso drink for half price! Comments Off on Half-Price Starbucks – Last Day!